SONOMA TOURISM IMPROVEMENT DISTRICT GRANT APPLICATION: SPECIAL EVENT PROMOTIONAL PROGRAM We are writing today to request your funding consideration for the annual SVVGA winter event: VINOLIVO Weekend. a. Date(s), location(s) and basic information regarding the special event, including contact information for organizers/promoters. • Overview: Now in its 11th year VINOLIVO Weekend is aimed at generating wine visitor traffic to Sonoma Valley during the slower postharvest Winter season. VINOLIVO Weekend event was originally conceived as a key anchor event in support of the SVVB’s Olive Festival, and last year with a change in dates it supported the Visitor’s Bureau’s Girlfriends Getaway campaign helping to attract off-season visitor traffic to the valley and put “heads in beds”. The weekend has expanded to include a menu of events where guests are able to experience Sonoma Valley wine and food culture first-hand while meeting the vintners and growers who produce wine in this world-class wine region. VINOLIVO Weekend kicks off on Friday evening with its signature Grand Tasting event which brings together over 60 wineries and 25 of the Valley’s finest culinary artisans for an epicurean celebration of Sonoma Valley. The festivities continue on Saturday and Sunday when some 40 wineries welcome ticket holders with exclusive VINOLIVO offers and experiences. Intimate winemaker dinners round out the evening schedule offering a deeper exploration into the delights of food and wine pairing. Over 800 guests attend the various events throughout the weekend. • Producer: Sonoma Valley Vintners & Growers Alliance | 783 Broadway Sonoma, CA 95476 | 707-935-0803| www.sonomavalleywine.com b. Statement as to whether the event is a new event or a recurring event. • 2016 will serve as the 11th Annual VINOLIVO Weekend. This event has evolved over the years to become one of Sonoma Valley’s signature wine and food events and a key driver for off-season wine visitor traffic to the valley. c. Explanation of what efforts will be utilized to drive visitors to in-City lodging and businesses. • Information regarding in-city lodging and merchants will be listed on the event website with additional information regarding these partners to encourage visitors to stay, shop and eat local. SVVGA will work with lodging partners to develop special promotions for weekend stays that will be highlighted in event promotions. Those guests purchasing the Weekend tasting pass will enjoy the benefit of complimentary corkage if they show their ticket at any of the participating restaurant partners. The branding of the event has been changed for 2015 to better emphasize the full weekend nature of the event. The VINOLIVO Weekend kicks off on Friday as the first day that Ticket to Sonoma tasting pass can be used to access special VINOLIVO offerings at wineries throughout the valley. Friday evening is home to the signature Grand Tasting event which is a major draw for the event. The on Friday followed by the Grand Tasting on Friday evening. The festivities continue on Saturday and Sunday when some 40 wineries welcome ticket holders with exclusive VINOLIVO offers and experiences. Intimate Winemaker Dinners round out the evening schedule offering a deeper exploration into the delights of food and wine pairing. d. Demonstration of how verifiable overnight stays in City limits and ancillary economic benefits to Sonoma businesses (restaurants, retail, etc.) will be tracked. • Nearly half of our 800 attendees are visitors from outside Sonoma County. Guest information is tracked via the event’s online ticket store. A survey question will be generated at check-out for each guest - prompting the ticket-holder to share if they are staying at a Sonoma Valley lodging partner. Another survey will be generated for participating tasting rooms to track wine sales and traffic to their tasting salons during the weekend. With more than 800 attendees from out-oftown, we project that over 350 seats will be reserved at local restaurants. e. Projected number of overnight guests generated through the event. • Projected overnight room-nights 150-200. f. Organization/promoter’s track record of other successful events. 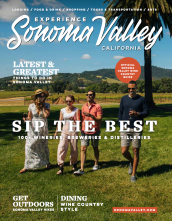 • The Sonoma Valley Vintners & Growers Alliance co-produces Sonoma Wine Country Weekend, the largest wine and food event in Sonoma County drawing over 6,000 event guests and grossing over $5.25 million. VINOLIVO Weekend has been a successful event for the last ten years with many returning out-oftown guests. g. Explain how the event is to be promoted. • Promotional efforts range from print to online with the following outlets: i. San Francisco magazine print and online (website, consumer e-blasts, social media posts via Facebook and Instagram) ii. Boosted and promoted posts via SVVGA’s social media outlets – Facebook, Instagram and Twitter – geo-targeted to target audiences. iii. Digital promotion and advertising via: 1. SFGate.com 2. Google ad word campaign targeting markets as listed above – January – February iv. NBC Bay Area – promotional ads and online calendar v. E-blasts to SVVGA consumer list vi. Participating vintners and restaurants will promote the event through their wine clubs, email communications and social media pages. vii. Sonoma County Tourism and Sonoma Valley Visitors Bureau will highlight VINOLIVO Weekend via email communications and social media pages. h. Amount of grant funding being sought and what the funding will be utilized for, including a statement as to whether funding is being sought for marketing of the event. • $10,000 –Funds will be used for promotion to consumers outside of Sonoma Valley. Currently, 35% of event attendees are from outside of Sonoma County, however the goal is to increase that percentage to 40-45%. Specific target markets for marketing of VINOLIVO Weekend include San Francisco, East Bay, South Bay, Southern California (San Diego, Los Angeles, Orange County). Marketing programs will range between print and online. i. Statement as to whether the event has garnered the necessary permits and permissions from all appropriate governmental agencies or a statement as to where the applicant is in the process. • SVVGA follows all permitting requirements for all events produced throughout the year. The Renaissance Lodge at Sonoma Resort & Spa has also committed as host venue for the Grand tasting. j. Statement as to whether the event will proceed if the Sonoma TID funding is not granted.